Here am i again, staring into my laptop screen while waiting for my hair to dry after a late night bath, thinking about what to update for my blog. Frankly, i think i have been worrying too much about my blog lately. The spike in visitors a few days ago sure influenced me. Sometimes, i can even refresh my blog's dashboard a few times per minute just to see if any new visitors drop by my blog. I have no idea why am i so concerned about the number of visits i get, but i just guess it's one of our human desires shown here. The desire to be accepted and acknowledge. And you know that you're accepted and acknowledge by others when your blog view count hits thousands by the day followed by the influx of comments. However, i realized that that's not the way to go. How many people can really hit thousands of views per day? We have millions of blogs on the web with just only so few readers. And if i'm writing a blog post merely because i want many people to view my blog and like it so it could be indirectly translated to mean that they accept me, then there's really no point blogging right? In the quest to make myself more popular, i am not being myself anymore. Who cares if my blog only attracts one reader per day? At least i know that he/she is my number one fan and i do not have to sacrifice myself just to be popular. Which is why i'm resolved to just write posts according to my style without worrying how others might think. This is anyway, my own blog. You can't please everyone all the time right. And you can always have the choice of clicking the red X if you dislike my blog. No one is forcing you to stay. 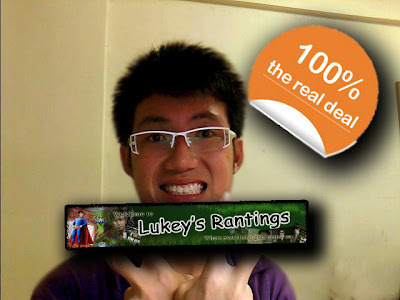 So from this post onwards, everything will be 100% authentic Lukey material! No more writing dumb posts in hope of getting more people to come my blog. Sometimes dumb posts really make my day :) it's entertaining. the way u blog is entertaining.